Historically, and much like its peers that formed the “Seven Sisters” group of oil majors, the great thing about Chevron Corporation (NYSE: CVX) was that it offered a certain degree of stability to its shareholders despite the inherently cyclical nature of the oil industry. In the good times cash would be generated hand over fist to cover dividends, capital expenditures, stock buybacks and maintain suitable cash reserves. In slumps the company would display the kind of scale and balance sheet flexibility required to maintain dividends and pick up new assets from distressed operators even as profits tanked. This is the short version explaining how Chevron has managed to chalk up thirty or so years of consecutive annual dividend increases despite numerous “boom and bust” oil cycles over the same time frame. So long as you were prepared to ignore the ups and downs of the wider industry you got a level of stability that perhaps wasn’t present with smaller companies operating in the same space. That said Chevron shareholders will be all too aware that the post-2014 oil price environment has proved a pretty tough one for the company. In the good times between 2010 and 2012 – a period when oil prices were regularly in the $90-100 a barrel range – Chevron generated over $30 billion in post-capex free cash flow versus total dividend commitments of around $18.5 billion. In other words the company was comfortably funding its shareholder “obligations” of paying progressive distributions while generating enough cash to fund capex and maintain a healthy balance sheet. Now fast forward to the present day. The price of oil has fallen to around half the level it was in 2012 and the company’s balance sheet sports a net debt position of approximately $38 billion. With that in mind it won’t come as much of a surprise to see that Chevron’s cashflow figures for the period covering the recent downturn have made the dividend look wildly underfunded. The short version is as follows: between the start of 2013 and the first half of 2017 the firm generated a cumulative total of just under $100 billion in cash from its oil & gas operations while spending around $163 billion on capex and cash dividends for shareholders. Compare that to the previous three-and-a-half year period (i.e. 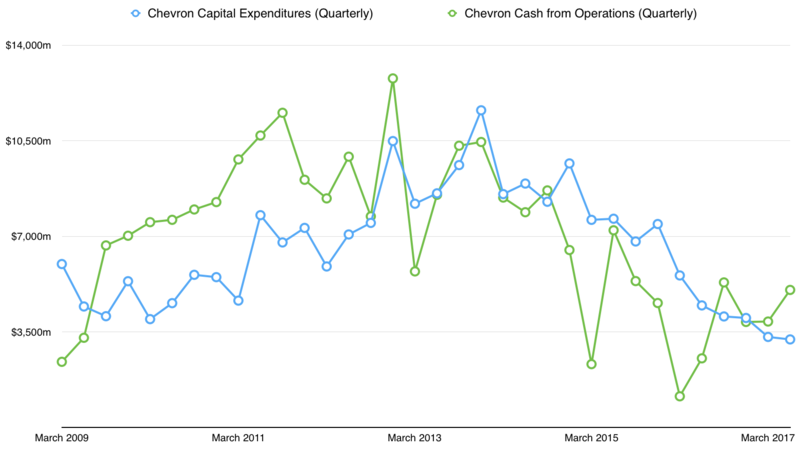 from the second half of 2009 to the end of 2012) in which Chevron generated a cumulative total of $10 billion more from operations than it spent on capex and dividends. Overall it paints a picture that suggests that the current dividend spend is perhaps only sustainable at significantly higher oil prices. In fairness the short version doesn’t take into account a couple of key points. First up is the fact that a big chunk of Chevron’s capex during the downturn was spent on exploration and developing major long-term capital intensive assets (e.g. the Gorgon and Wheatstone liquified natural gas projects in Western Australia). Back in 2014 only around half of the annual capex budget was spent on projects expected to be cash generative within two years. This year the figure is around 75%. As a result, by 2020 total average daily production across the company will be noticeably higher than it was back in 2012, even after taking into account the cumulative effect of asset sales scheduled to occur between now and then. Staying on that point it’s also worth mentioning that this increase in production will occur against the backdrop of decreasing capital expenditure as these projects become fully operational. 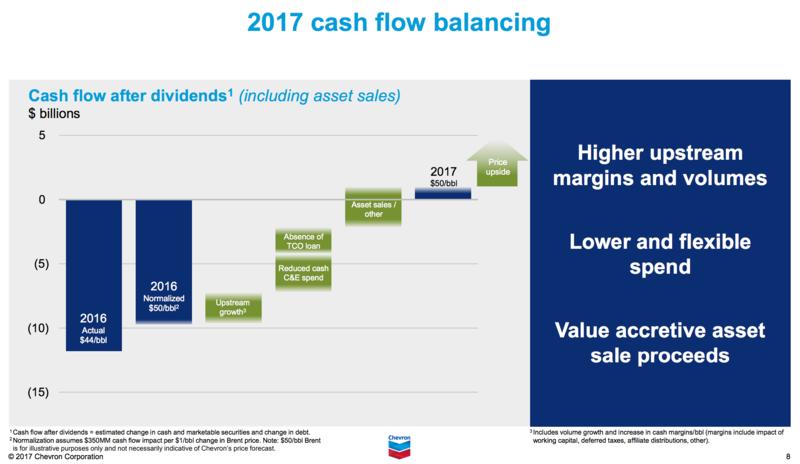 In other words the effect of increasing cash flow from higher production plus decreasing cash outflow from lower capex should represent a welcome development in terms of cash flow for those who are following Chevron because of its dividend. 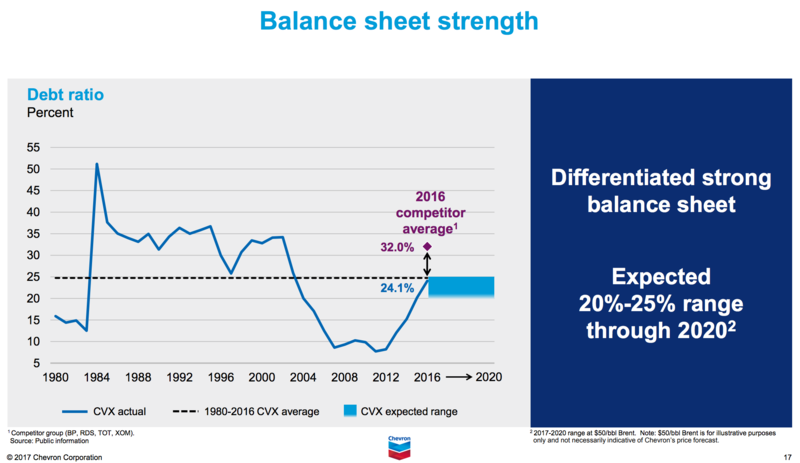 Secondly, and like all companies across the industry, Chevron has been going to great lengths to adjust to the new lower price environment. For example, since 2014 the company has reduced its quarterly operational expenses plus selling, general and admin expenses by around 25%. Add that to the aforementioned increasing levels of production and you’re looking at a welcome boost in terms of cash inflow. Judging by results so far in 2017 it appears these measures are finally starting to take shape. Over the first six months of the year Chevron generated around $8.9 billion in cash flow from operations – up around 130% from the $3.9 billion reported over the equivalent period in 2016. If you include asset sales then company managed to achieve overall positive cash inflow of around $1 billion after subtracting capex and dividends. So where does all this leave us going forward? Well, if company guidance is anything to go by then by the end of the decade investors can expect to continue to see the positive effects of higher production, continued productivity/efficiency improvements and, of course, a significantly lower capex bill when compared to the 2012-2016 period. As far as production is concerned Chevron expects to be producing somewhere in the region of 3 million barrels of oil equivalent by 2020 after taking into account the effect of asset divestments. That’s an increase of around 15% on what the company was producing at the end of last year. At the same time the company forecasts that ongoing efficiency/productivity increases (e.g. continuing to lower the cost structure) will materially increase their cash margin per barrel, even if oil prices don’t budge from the current $50 per barrel mark. As for capital expenditure Chevron is guiding for spending in the range of $17-$22 billion per year, which puts it roughly inline with the deprecation expense of existing assets. Should the price of oil stay in its current area of around $50 per barrel then we can expect to see annual capex spending come in at the lower end of that range. All-in-all the net effect at a $50 per barrel oil price is that free cash flow after dividends is set to increase to just under $4 billion from the current 2017 figure of $1 billion. It’s tight, but there’s probably enough breathing space there after capex and dividends to ease shareholder concerns regarding being self-funding. Indeed the company expect the debt ratio to remain in the current 20-25% range through to 2020 at current oil prices. Of course the situation will look significantly better should prices rise in the intervening period. According to company projections shareholders could expect the firm to add another $3-4 billion on top of that initial $4 billion post-dividend free cash flow figure in a $60 per barrel price environment. Should prices reach the $70 per barrel area, then expect to see a further $4-5 billion on top of that (i.e. around $12 billion in total annual post-dividend free cash flow in a sustained $70 per barrel oil price scenario). 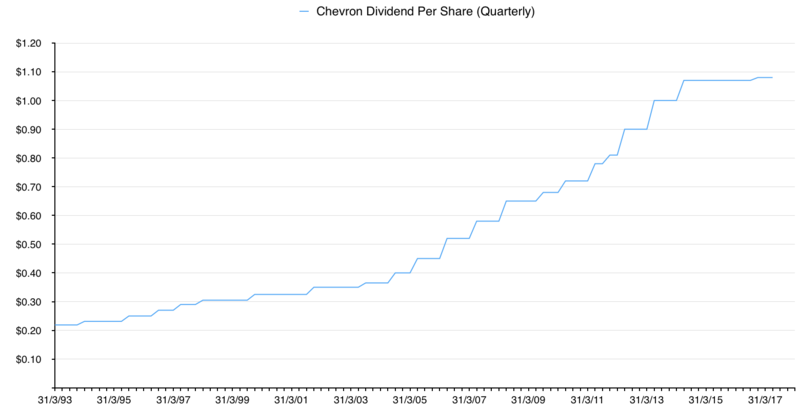 Given a 4% dividend yield you could debate whether Chevron stock is attractive enough right now, especially given the similar valuation on offer at Exxon Mobil, though that’s probably a question for another article.